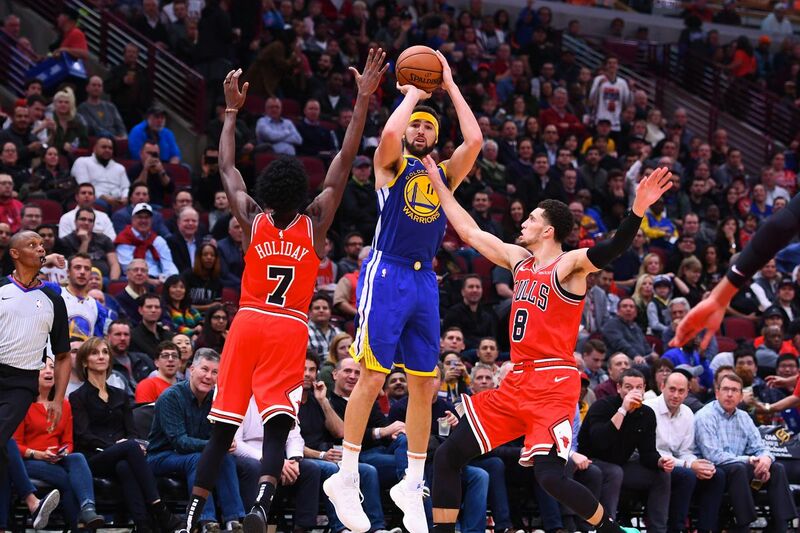 Klay Thompson broke an NBA record previously held by teammate Steph Curry on Monday night by hitting 14 three-pointers in a single game during the Golden State Warriors� 149-124 victory over the Chicago Bulls. Thompson went 14-for-24 from long range on his way to scoring 52 points in just 27 minutes of action. The barrage broke Curry�s previous record of 13 threes in a single game. Thompson also hit 10 three-pointers in the first half, tying a record set by Chandler Parsons in 2014. For Thompson, the explosion allowed him to break out of the early season struggles that had plagued him through the team�s first seven games. As the game went on, it was evident that the Warriors were rooting for Thompson to break the record, feeding him for threes whenever possible. That even extended to Curry, who held the record until last night. Thompson broke the record with just under five minutes left in the third quarter. After that, he was pulled from the game. His Warriors teammates said afterwards that they knew Thompson was in for a special night after his red hot first half, though they didn�t say anything for fear of getting in his head. Kevin Durant said it felt special to see the record broken not once, but twice during his time with Golden State. Thompson has been one of the premier three-point shooters in the league since his debut in the 2011-12 NBA season, shooting over 40 percent from beyond the arc every year. However, his early season slump saw him struggling from deep to start the year: even with his breakout game, Thompson is only shooting .317 on threes thus far, well below his career average. Thompson�s outburst was yet another display of the sheer number of weapons the Warriors have on their roster. That depth and talent level has made them an overwhelming favorite to win another NBA championship this year, with William Hill listing Golden State as an 8/15 favorite to win the title.